It was Maurice Greer’s magpie eye that saved The Human Instinct. The name still had value, so he’d have that for a start. As the most successful New Zealand group in the UK in the second half of the 1960s, it had gathered considerable cachet alongside an acknowledged ability to change with the musical times. The young stand-up drummer and backing singer had the departure of guitarists and songwriters Dave Hartstone and Bill Ward to deal with as well, so he set about finding a guitar player with a new sound to join him and surviving bass player Frank Hay. The re-bored Human Instinct would still follow the 1960s musical evolution, but that was fracturing through new intent and technology and it was the strand heading underground that appealed. The electric blues power trio format made fashionable by Cream, The Jimi Hendrix Experience and dozens of lesser lights became the new central influence for the group. And Maurice Greer knew just the guy for that. Manager Frank Greer (Maurice’s brother) summoned Māori master guitarist Billy TK (Te Kahika) to Auckland, beginning a process of constant rejuvenation that would see The Human Instinct survive well into the 1970s. In Te Kahika, Greer had an indigenous Hendrix-like player, perfect for the times. They were both veterans of Palmerston North show and beat bands. Billy TK had recently been a member of The Sinners with the late Ted Cash (drums), Sonny Ratana (bass) and Harry Hines (vocals). The Sinners played the Orange Hall as the “Maori Battalion”, booked by “Beret Ben” Ngatai; and a club in Wayne St (near Palmerston North’s Post Office) and supported The La De Da’s, Peter Nelson and The Castaways and The Underdogs, who made a big impression on Billy. Leaving in 1968 on the Southern Cross to Sydney, where he had cousins in the Maori Volcanics, Billy bumped on to Melbourne where his friend Reno Tehei (Sounds Unlimited) had Compulsion (ex-Joyful Crye) up and running and making waves. He formed a new working group there with Graham Hirst (The Fenders/Tangerine) before returning to New Zealand to join The Human Instinct. The new sound and line-up hit the times bang on and Greer was keen to show it off on a three-month national tour. When Frank Hay dropped away Michael Brown, then Peter Barton, joined on bass. The new sound and line-up hit the times bang on and Greer was keen to show it off on a three-month national tour from September. Historian Keith Newman put the appeal down to “Billy’s fiery yet controlled style, his use of the wah wah, his Hendrix-like afro, Greer’s stand-up drumming and flowing locks, and the tumbling bass of Peter Barton”, saying it “mesmerized the locals”. In his 1960s Auckland scene survey Hostage To The Beat, rock historian Roger Watkins, paints a vivid picture of The Human Instinct onstage late in 1968 at Bo Peep in Durham Lane, central Auckland; a space that previously housed the Top Twenty and 1480 Village clubs. “It was a bit of a revelation to the punters. Greer was featuring his new concept in drum kits, an electronic set-up that combined tympani instead of toms. These were fitted with pick-ups fed into a bank of Marshall amps and included a regular snare drum and a fixed hi-hat (Greer played standing up). The bass drum pedal impacted onto a block of wood fitted with a pick-up instead of a bass drum. With the new line-up sorted and firing, the need for fresh material became paramount. Greer hadn’t finished with London yet either. The new Human Instinct line-up headed back to the English capital in February 1969 for a “holiday”. There were shows in Rome, Hong Kong and London, but mostly work was thin on the ground. At least they were able to solve their repertoire problem. Popular Auckland session and live guitarist Doug Jerebine, now resident in London, had recorded over a dozen Hendrix-style blues rockers and softer acoustic pieces with lyrics on The Human Instinct’s 4-track, with Dave Hartstone’s assistance. When the new slim-line Human Instinct was preparing to head back to England in 1969, Jerebine asked if he could fill in until they got there. Maurice Greer: “He wanted to join on bass for the transition, but said he wouldn’t stick around long once he got there. I went a bit cold at that. I shouldn’t have done. Here I was talking to brilliance. I ended up taking his style, getting his groove later. I should have got him.” But at the time Greer was looking for a pop-style bassist and deemed Jerebine a bit out there with his long hair and beard. On their return to England in February 1969, The Human Instinct found Doug Jerebine already there. His contact was Dave Hartstone, who managed him in his early days in London. The Hartstone connection served Jerebine well, gaining him a prestige gig as Jeff Beck’s bass player, hot on the tail of Jeff Beck Group’s early USA success. Jerebine played with the former Yardbird in England and a couple of gigs in the United States before Beck dismissed him. Jerebine wasn’t renowned as a composer, although if the album had been released at the time that would have quickly changed. His recording showcased a varied collection of original songs that encompassed a range of styles, from the frantic chunky Hendrix riffing of ‘In The Shade of the Midnight Sun’ and ‘Wake Me’, through gentle acoustic guitar based ballads such as ‘Circles’, to sunny tunes and funky blues jams like ‘Hair Down To My Knees’. By the standards of the time, it was an exceptionally strong collection let down only by a weak vocal – a veritable lost NZ classic – lost, but not completely unheard. Jerebine was now calling himself Jessie Harper, part homage to Hendrix and part Jessie James. But circumstances would conspire to keep this side of the guitarist hidden from the wider public eye for the next two and half decades. First, Jerebine was now calling himself Jessie Harper, part homage to Hendrix and part Jessie James. When the songs gained wider exposure through The Human Instinct they were credited to Jessie Harper, not Doug Jerebine. Strange, considering the respect he commanded in New Zealand, where the tapes had already been heard by the music industry in-crowd. A master tape sent to Bob Gillett and made into an acetate at Stebbing studios by Harvey Mann was further taped and passed around. While he was in England, Greer gathered up more new songs from recently released English releases. 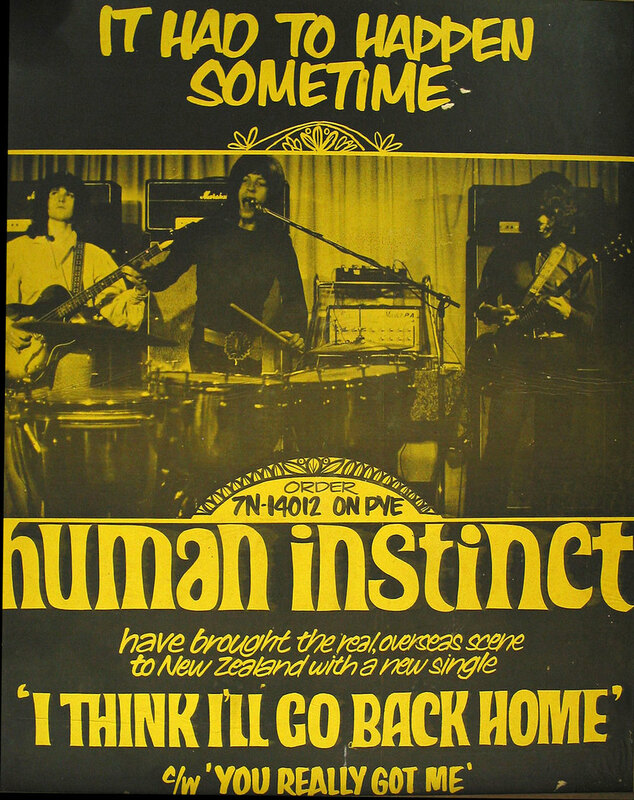 The title track of Human Instinct’s first NZ album, Burning Up Years (late 1969) is the group-composed flipside of Birmingham group Hard Meat’s only Island Records 7-inch from 1969. ‘Maiden Voyage’, credited to Maurice Greer on Burning Up Years, is an Ashton, Gardner and Dyke album track. ‘When I Think I’ll Go Back Home’ – a Human Instinct single in 1970 credited to Jessie Harper – is actually a version of Neil Young and Crazy Horse’s ‘Everyone Knows This Is Nowhere’. That left three Jerebine compositions – ‘Blues News’, ‘Ashes’ and ‘Matches and Fall Down’ – and a mind-bending take on The Kinks’ ‘You Really Got Me’ (the album’s single) to round out Burning Up Years. When they arrived home in New Zealand in mid-1969, The Human Instinct brought with them a new modern PA and amps. Avoiding pub gigs, the heavy trio secured another residency at Bo Peep, with Larry Waide replacing Barton. A second album, Stoned Guitar (June 1970), wasn’t long in coming. On it, Billy TK comes into his own, especially on the sonic soundscape of the title track where he explores the limits of his playing and the new technology enhancing it. Two of Doug Jerebine’s strongest compositions are album highpoints – the onomatopoeic ‘Jugg a Jug Song’ – and ‘Midnight Sun’ – where TK takes the crunching, riff-driven electric blues of the original and adds a more nuanced feel through distortion, space and dynamics. ‘Midnight Sun’ was backed with the non-album track ‘Ideas’ for single release. ‘Black Sally’, an Australian hit for Mecca in March 1970 sung by New Zealander Clive Coulson (Dark Ages) was another perfect single for the times, blending a heavy sound with an infectious hook. Backed with an airy take on John Kongos’ ‘Tomorrow’ that had Maurice singing over new bass player Larry Waide’s acoustic guitar, it became one of the group’s signature records. That left the extended “live” version of Taste’s ‘Railway and Gun’ recorded at Bo Peep to complete the LP. Live in the studio … with added applause, that is. There would be one final single (a version of Michael Chabon and Choctaw’s ‘Texas Sparrow’) and an album in June 1971 with the “Māori Hendrix” – Pins In It – featuring the lighter sound of ‘Rainbow World’ (also a single) and a crack at Roger Waters from Pink Floyd’s ‘The Nile Song’ alongside more trademark Human Instinct psychedelia. That same month, Billy TK made it as far as Australia with Greer and new bass player Neil Edwards, a former Underdog, where he left the group after live shows at Sydney’s Chequers nightclub and televised versions of ‘Rainbow World’ and ‘The Nile Song’ for GTK. A change in style and sound found Greer fishing again in the large pool of NZ beat, R&B and psychedelic era players. A change in style and sound found Greer fishing again in the large pool of NZ beat, R&B and psychedelic era players who’d been reacting to the ever-changing sounds coming out of the USA and Britain since the 1960s. Graeme Collins joined on keyboards and was then replaced by The Fourmyula’s Martin Hope and fellow Wellington guitar ace John Donoghue for the country rocking Snatmin Cuthin (1972). Never one to let a good song go to waste, Greer placed versions of Hope’s late-era Fourmyula single ‘Turn Your Back On The Wind’ and Edwards’ ‘Ballad of Jacques La Mere’ (a hit for Headband) on the Zodiac Records released album. 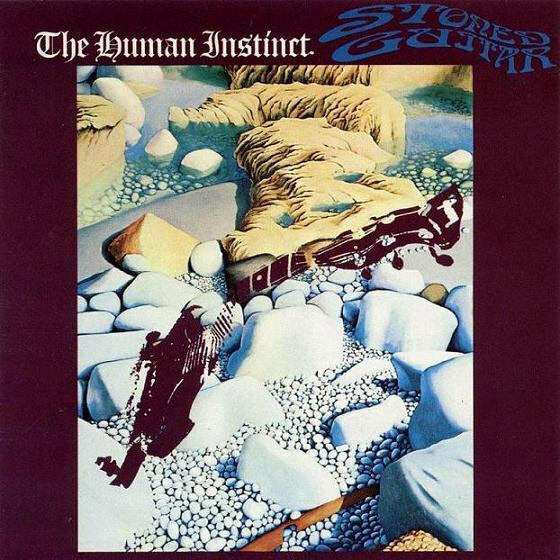 The Human Instinct’s fourth album followed in 1974 on Zodiac Records, preceded by a single, 'Gypsy Lady'. The Hustler had a country-rock feel, a 1930s gangster era theme, and featured a poised ballad/shuffle with a psychedelic air, ‘Stoned Mary’. By then, the Greer brothers were well established at designing and building nightclubs, including Granny’s in the Bo Peep premises, and a little later, Granpa’s upstairs. When Greer shifted to Christchurch to set up Christie’s nightclub, Neil Edwards jumped ship and was replaced by the teenage Glenn Mikkelson on bass and vocals. Next on board was Christchurch guitarist Phil Whitehead (Beam, Movement and Father Time) who replaced Donoghue, and keyboardist Steve McDonald, who joined for a residency at yet another Greer club, Shantytown, under Auckland’s Civic Theatre. This line-up recorded a then unreleased album, Peg Leg, described by Keith Newman as having a sound that “is fat and full, the influence of Pink Floyd, Moody Blues, Genesis, Yes and even Bowie is evident, but the multi-layered arrangements on these walls of sound are all Human Instinct. Even the one cover track, a nine-minute take on Lynyrd Skynyrd’s ‘Freebird’ puts a fresh complexion on the old rock classic.” After rescue and restoration Peg Leg was finally released in June 2003. ‘Tight Rope Walker’ and ‘Fallen Sky’, written and sung by Glenn Mikkelson, and his composition, ‘All Time Loser’, are particularly well-realised, giving broad hints of what Mikkelson would achieve in England as Bowie-ish performer Zaine Griff. When Hot Licks caught up with Maurice Greer in 1975, he already had a new band line-up functioning. Peter Cuddihy was the recently recruited bass player. Martin Hope, who’d been part of The Human Instinct’s residency at Greer-built Auckland club Granny’s, rejoined for a new slot at Greer’s English-styled Crofts club in the old Mojos space at 26 Airedale Street opposite the Auckland Town Hall. He replaced Phil Whitehead. The Human Instinct had just released their final single, the Martin Hope penned ‘Tropical Paradise’, a live favourite on Family Records. They’d be around a few more years yet with new band line-ups in Auckland nightclubs before Maurice Greer disbanded The Human Instinct in 1979 while operating The Astro. He continues to resurrect the group, most recently for shows in Korea and at Auckland’s Kings Arms in November 2010 with a line-up of Joel Haines (guitar), Phil Pritchard (guitar) and Tony Baird (bass). The Human Instinct’s first three LPs were re-released by German bootleg label, Little Wing of Refugees in 1988 and much of the group’s extensive catalogue has been made available since.